This is a fine recipe with one exception. 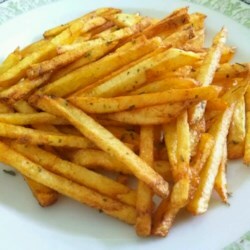 The trick to french fries that are crispy on the outside and tender on the inside is to first soak then in cold water. Dry thouroughly. Fry TWICE...first a short fry (like blanching vegetables, but in oil), drain and then fry a second time until golden and crispy. This should give the desired results. My friends know I can't eat a soggy fry... and I love fries ;-) ) Happy frying.